AntiSpyware Soldier is a corrupt anti-spyware program illegally installed to user computers by widely spread trojans, through malicious advertisements and via numerous exploits. 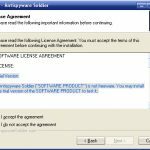 This application is not only a weak spyware remover, but also a clone of the infamous SpyAxe, Spyware Strike, SpyFalcon, Spyware Quake, Spyware Sheriff and VirusBlast risks. We have carefully tested AntiSpyware Soldier on several computers including absolutely clean machines and PCs infected with spyware and adware parasites. Test results revealed that although the program does not produce false positives, and really finds some malicious threats, it cannot completely eliminate most prevalent infections, and therefore is definitely unable to protect user privacy and system security. The application refuses to remove any parasites it finds and asks to register and purchase the full product. 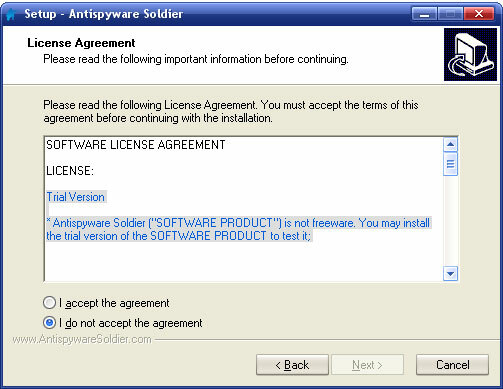 Essential program components like Soldiers, real-time monitors, are not available in the free version, which the makers of AntiSpyware Soldier call trial. However, it is not fully functional, and therefore is only a demo. The program is illegally distributed with the help of widely spread parasites, malicious advertisements and numerous exploits. In our opinion, AntiSpyware Soldier’s vendor and its affiliates must be held fully responsible for such issues. We have already received user complaints stating that their computers are infecting with the AntiSpyware Soldier parasite, which displays fake warning messages, downloads the corrupt spyware remover and hijacks the web browser. AntiSpyware Soldier is a twin of Spyware Sheriff and Titan Shield. It is also a clone of SpyAxe, Spyware Strike, Spy Falcon, Spyware Quake, SpyHeal and VirusBlast. All the applications have very similar interfaces. They consist of analogous components. Domains associated with the program are antispywaresoldier.com and antispynet.com. DO NOT buy this product! AVOID AntiSpyware Soldier at all costs! This entry was posted on 2014-06-12 at 06:52 and is filed under Corrupt Anti-Spyware, Software.